Kourier Publisher for DataFlo is an excellent solution that offers an easy, effective way to communicate with your customers and suppliers by sending them reports and business forms in Adobe PDF format via e-mail or fax. This tip will show you how easy it is to publish AR Statements from DataFlo. The Publication (i.e., AR Statement) will be defined so that only those Contacts whose Customer Number matches the Bill To on the Statement, who have an e-mail Address, and who subscribe to the AR Statement will receive the Statement attached to an e-mail. Note, these statements look much better if they are printed on an electronic form such as the one provided by Kore with their Kourier Forms Manager. 1. Define the Publication. From the Kourier Publisher menu select Publications (KMK-32). At the "Email Template" field (#4) be sure to Zoom (.A) to the "Email Message" Template screen and create it as shown below in Step 2. Be sure to enter a Y in the "Subscribers Only? field (#10). This will make sure that only those Contacts who subscribe to the AR Statement Publication will receive it. 2. 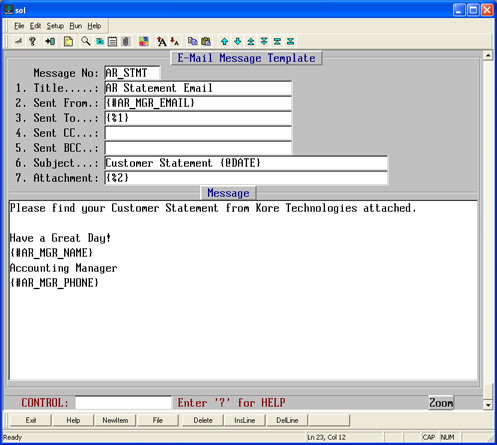 Define the E-mail Message Template. 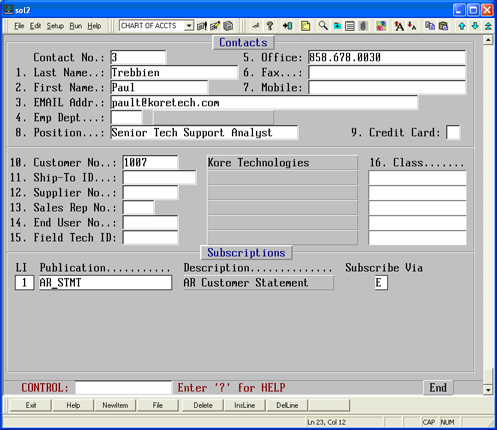 Select E-mail Message Template (KMK-01) from the Kourier Publisher menu and enter the fields as shown below. Note, all of the values that start with "#" in the screen below (e.g., #AR_MGR_EMAIL, #AR_MGR_NAME, and #AR_MGR_PHONE) are Substitution Literals and should be defined by using the Substitution Literals screen (KMK-02). Instead of using the substitution literals you may simply enter text in those fields. 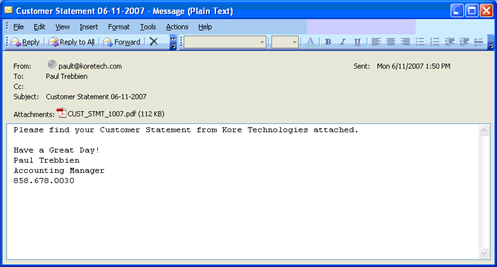 The %1 entered into the "Sent To" field is a Context Value Tag and in this case is maintained by Kourier Publisher and in this case is the e-mail Address of the Contact who is related to the Customer for which the Statement is being printed. 3. 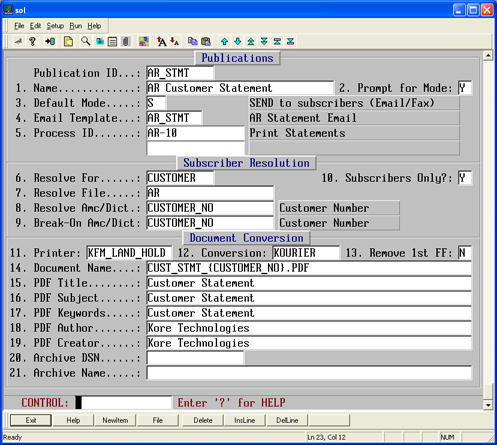 Modify the Report Manager process to use Kourier Publisher. Edit the Report Item for Print Statements (AR-10) and change the "Verb" field (#14) to KT.SENDPUB and enter the Print Program name (AR.18) into the "Statement" field. That’s it, the new AR Statement publication is ready to go. 4. 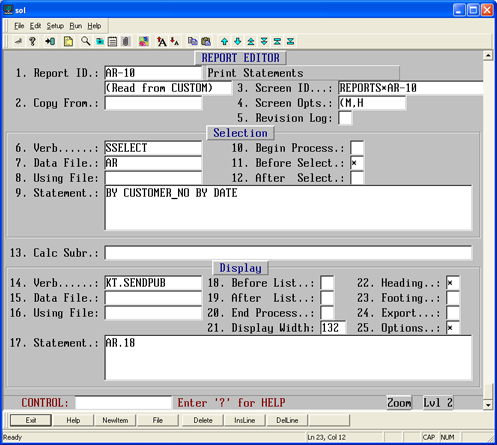 Define Contacts to Receive Statements. In order for someone to receive the AR Statement publication, they must be "Subscribed" to it. To do this, edit a few Contacts (KMK-22) and make sure they have an e-mail address entered (#3), and their Customer Number (#10) must match the AR Bill To Customer, and under the Subscriptions line item section, the AR_STMT publication must be entered. 5. E-mail results! Finally, the e-mail your customer will receive looks something like the example below. Notice the file attached to the e-mail, this is the customer's statement converted to PDF format and is ready to read. Kourier Publisher also makes it very easy to archive reports and forms you publish to a secure location of your choice, allowing you to create your own electronic document library. Call us to find out more if you are interested.